The President and the Chair: President Trump, Treasury Secretary Mnuchin, Chair Powell and Vice Chair Clarida met for an informal dinner yesterday. It doesn’t appear that much new emerged. Monetary policy has become less of a threat to the economy so the White House had little incentive to create a hostile environment. The inclusion of Mnuchin and Clarida reduced the odds of confrontation. If this meeting had been held in November, it could have been tense but the recent change in monetary policy defused the situation. A warning sign for the economy: Car dealers are reporting high levels of inventory; cars on deal lots are up 3% from last year (January), with nearly 4.0 mm vehicles available. If inventory levels remain high, automakers will begin slowing production which will tend to depress economic growth. 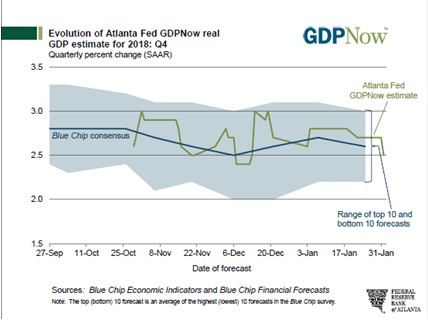 We also note that the Atlanta FRB’s GDPNow forecast shows growth falling to 2.5%. 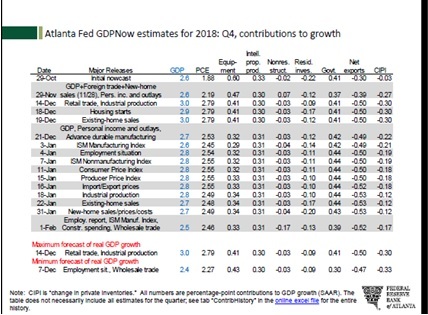 The contributions table shows that falling commercial building and declining inventories weighed on growth. 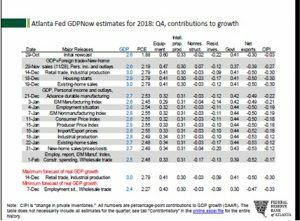 The data flow to calculate this number has been affected by the government shutdown but the overall trend does suggest that GDP is falling back toward the 2.0% to 2.5% growth level. Thinking about the next recession: Over the past 11 years since the financial crisis, central banks have deployed unconventional policy tools; the two primary ones were balance sheet expansion and negative interest rates. Both are controversial. 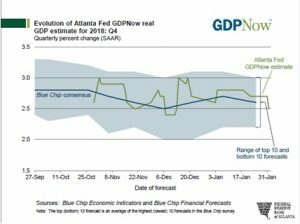 The impact of quantitative easing (QE) on the economy remains in dispute. In Europe, negative interest rates were used; although there wasn’t a lot of evidence of disintermediation, it wasn’t obvious there was much economic stimulus from the action either. A new study from the San Francisco FRB suggests the Federal Reserve should have used a negative fed funds target instead of QE. The report suggests that inflation would have increased faster and growth would have been stronger with negative rates. Although we doubt this will be the final word on the issue, we would expect the FOMC to consider negative interest rates in the next downturn. Will the China hawks lose? Our most recent WGRs discuss the trend of U.S. policy toward China. The conclusion of the report is that the U.S. and China are likely moving toward an antagonistic geopolitical stance. Current trade talks reflect this issue. On the one hand, using trade to change China’s behavior should be the long-term policy of the U.S. However, in the short run, such a policy might lead to financial market turmoil and undermine the president’s reelection campaign. Reports suggest that trade hawks are worried the president might be inclined to take a short-term deal to boost financial market sentiment at the cost of delaying the inevitable shift to a more hostile policy stance. The Bundesbank returns? ECB President Draghi’s term ends in October. The race to replace him has been underway for months. The EU has been developing some informal rules for key positions. The ECB has had a southerner with Draghi, so a northern European nation should get a “turn.” The leading candidate is Erkki Liikanen, a Finn and former member of the ECB. Recently, though, Jens Weidmann’s star has been ascending. Merkel has been using Weidmann for leverage on other EU issues; most of the southern nations are leery of Weidmann, fearful he will implement Bundesbank-era hard money policies. We still view Weidmann as a long-shot candidate. But, if he does get the job, we would expect the EUR to appreciate on the news. Populism on the rise:Yesterday, we commented on the growing war on capital. We note the establishment is pushing back against the Jacksonian thrust of the White House. The president’s instincts are to pull troops out of the Middle East, for example, concluding there is no end to these conflicts. He isn’t wrong on this assessment; however, enduring never-ending conflicts is part of the hegemonic role. At the same time, what the establishment doesn’t seem to understand is that the bulk of the nation’s voters are at a loss as to why the U.S. must play the superpower role. In our opinion, the Truman administration sold hegemony to the American public as necessary to contain communism. Although it was certainly true, it was only partially true. To avoid WWIII, the U.S. also needed to contain long-standing geopolitical confrontation zones in Europe, the Middle East and Asia. The partial truth worked—Americans did get behind the role, but only as long as communism was a threat. The fall of the Soviet Union signaled to most Americans that the U.S no longer needed to expend the resources to police the world (remember the “peace dividend?”). From that point forward, Truman’s ruse was exposed. The establishment knew a withdrawal from the world was fraught with risk but it has been unable to create a new narrative to sell to the American people. Bush tried to do it with Islamic terrorism, but it didn’t really take. The establishment runs the risk of further losing the support of the American people unless it can show why the U.S. needs to maintain the role. From the perspective of most Americans, the superpower role goes hand in hand with globalization. And that’s because it does! Unless the establishment can convince the average American that globalization is more than trading a good-paying manufacturing job for cheap imports then the cause will be lost. So, for now, the establishment is taking advantage of Trump’s missteps to push back against troop withdrawals. But, it may be losing the broader policy goal. In a related op-ed, Gideon Rachman of the FT notes that one of the unknowns is whether the current populist uprising is a permanent change or merely a blip on the screen of a Davos-led globalized world. He concludes that the change is permanent, that Brexit, the yellow vests and Trump represent a multi-decade change in trend. This reflects our analysis of equality/efficiency cycles. Disintermediation is when households and firms withdraw money from the banking system for alternatives. The Eurodollar market in the 1960s and 1970s occurred because economic actors could not get a positive real interest rate from the U.S. banking system due to regulation and moved money into the unregulated Eurodollar market. In theory, if a bank offers negative nominal rates, households and firms will simply remove money from the banking system to earn a real yield on the cash. See WGRs, What to do with China: Part I (1/28/2019) and Part II (2/4/2019).